Very rarely from time to time, this blogger will stray away from the friendly confines of Michigan football discussion. But last night's Game 5 in the Stanley Cup Finals was simply mind-blowing. 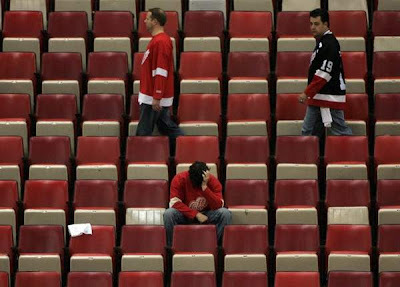 For the fans at the Joe last night, what an emotional roller coaster. But I have to hand it to them, they were crazy from the opening drop at about 8:15 last night, until the final goal in the 3rd overtime at 12:46 this morning. I'm no hockey expert, but I knew we were screwed when Jiri Hudler got hit with a 4 minute high-sticking penalty. I mean a 4 minute man advantage in overtime? Especially since the Red Wing's legs were gone by that point. Petr Sykora's goal was just waiting to happen. Not to play devils advocate or anything, but this is the kind of game that can change a series completely. Max Talbot's goal with 34.3 seconds left was about the must clutch goal I have ever seen. It will be very interesting to see how they bounce back tomorrow night at Pittsburgh. Also, just an FYI, I've added various links to Big Ten blogs on the right-side column. And it is surely to their credit, there is some fine writing going on there. Since I get a fair share of traffic from some of those fellas, I see no reason not to at least attempt to return the favor. But geez...do we need so many damn Buckeye blogs? Quintin Patilla..."Blasting" the New Staff?